The Purple Flag, a national award recognising a city’s vibrant and safe night-time economy, is now proudly flying in the City Centre. Equivalent to the Blue Flag awarded to top quality beaches, Swansea successfully gained the prestigious accolade in February 2015. 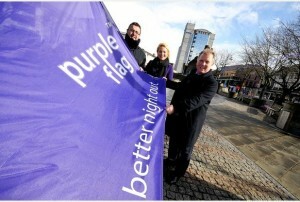 Purple Flag is an international initiative which is independently accredited by the Association of Town Centre Management working alongside the Purple Flag Advisory Board – a partnership involving central and local government, police, business and consumers. It is the new gold standard that recognises great entertainment and hospitality areas at night in the same guise as Blue Flag is an indicator of a good beach and Green Flag a good park. Swansea is the first city in Wales to achieve the standard, with Aberystwyth the only other Welsh location to hoist the flag. Judges said Swansea had achieved a consistent rise in the number of people using the pubs, restaurants, cinemas and other entertainment venues in the City Centre after dark while at the same time enjoying a steady drop in crimes committed in the area. As well as the excellent partnership working demonstrated by the Safer Swansea Partnership, which coordinated the application, the assessment team said they were particularly impressed with the Help Point facility situated in The Strand, which enables the public to be treated on site by qualified medical staff for minor injuries, illness or drink-related concerns. They also praised the use of student volunteers from the University of Wales Trinity St David to give guidance and assistance to their peers at the Help Point and Drop-Off Point. Other initiatives that received a glowing reference were the Swansea Street Pastors scheme http://streetpastors.org/locations/swansea/) and Taxi Marshalls (http://www.swanseabid.co.uk/safety-and-security.asp) who manage the taxi queues at night helping to get people home safely after an enjoyable evening.